"This idea came to me one morning as I had steamed carrots followed by a bowl of oats topped with pineapple and walnuts... I immediately wished I had combined the two and added a few more spices from some delicious desserts. Thus, this oatmeal was born." 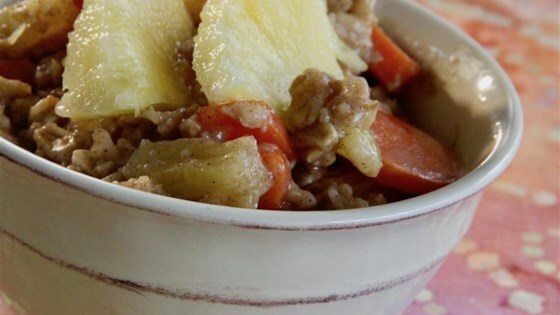 Combine pineapple, carrot, and water in a microwave-safe bowl. Cook in the microwave until carrots and pineapple are partially softened, 1 to 2 minutes. Stir almond milk, oats, cinnamon, and ginger into the bowl. Cook in the microwave for 1 minute. Stir. Continue microwaving in 30-second intervals, stirring after each interval, until oats are tender, 1 to 2 minutes more. Top with walnuts. Substitute pecans for the walnuts if desired. If using frozen carrots and pineapple, defrost in a microwave-safe bowl in the microwave for 1 minute. Added sliced tomatoes on top! Loved it!